When a person decides to venture out into the wilderness for an extended adventure, one of the most important aspects of their travels will be finding the perfect place to set up camp. 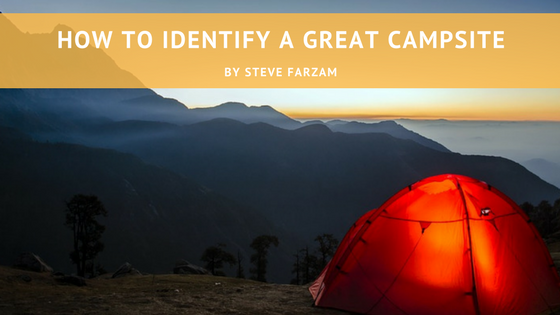 Here are just a handful of things a camper should look for to identify a great campsite. Picking a great campsite requires a moderate amount of forethought. Although dusk is the most common time of day to begin settling down in an area, a camper must also consider the effects of the sunrise on their night’s sleep. In order to ensure a good night’s sleep, a camper should pitch their tent in an area that has plenty of natural covering to prevent the bright rays of sunrise from waking them up too early. A camper should always maintain a healthy sense of self-preservation when choosing a spot for their campsite. Remain vigilant of any potential hazards in an area that would make the spot not ideal as a campsite. Some of the hazards they should look for and avoid are dead trees, dry river beds, large rocks or logs that could be home to venomous snakes, and steep hillsides or cliffs. Before a camper begins unpacking their tent to set up a campsite, they should be sure to give the ground a thorough inspection. When it comes to choosing a great place to set up a campsite, a camper will want to ensure that the ground has minimal or no mounds that could make sleeping uncomfortable. A camper should also choose to make camp on a level surface for safety reasons. Nature offers few conveniences the deeper into the wild you go, but a camper can make the experience easier for themselves if they opt to set up their campsite near a stream of water for bathing, a thick set of bushes for waste excretion, and trees to provide firewood. It is also better to follow in the footsteps of campers who came before by using well-worn campsites. This indicates that the site is ideal and popular. As a camper is traversing through the wild outdoors, they should keep an eye out for a great spot in which to set up their camp so they’re not scrambling to find an area in the dark. It’ll be virtually impossible to choose an ideal campsite once the sun sets. A golden rule of thumb is to leave the camp area cleaner than how you found it.